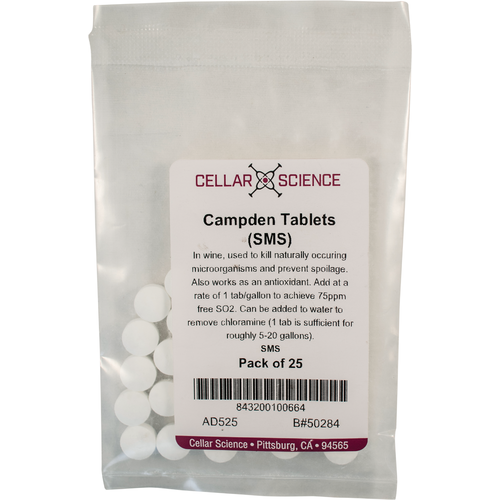 Sodium metabisulfite campden tablets are an excellent way to remove chloramine from tap water prior for brewing. Simply crush up one campden tablet, drop it in your brewing water prior to adding anything else, and proceed as normal! Unable to order Efferbaktol without double shipping charges. KEEPS BACTERIA OUT OF WINE. Need to clean that water, dawg. Making a mead from scratch and I need this for secondary. making a batch of wine and I need more Campden tablets. I need to remove the chlorine from my Brewing and sparge water. 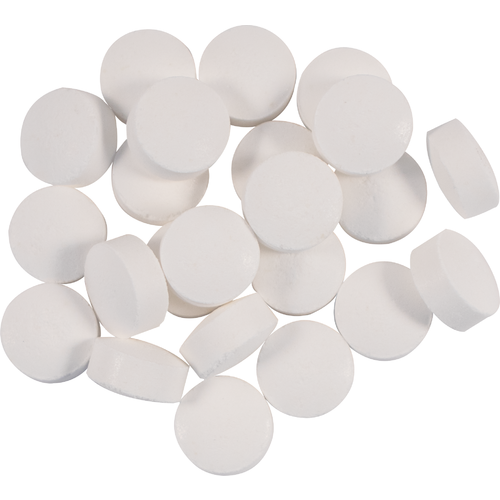 what is the amount of active sodium metabisulfite per tablet? I know it can range by manufacturer. Is it listed on the package? BEST ANSWER: These add 75 ppm of sulfites at the rate of one tablet per gallon. Must be ground up prior to use. Yes, I'm aware of what it says on the website but it would be much more helpful to list what the active amount of SMS is per tablet. The ones I currently have state 550 mg active SMS. I was looking for that number as it would be much easier and more accurate for my applications. Just a suggestion that MoreBeer add that to the packaging info. My city water is treated with chloramines, so I bought some of these. They are easy to use and cheap. Instead of buying bottled or packaged spring water, you can convert your municipal tap water into a more ideal profile using this to remove chloramine. I have noticed fewer off flavors and a saison made with this came out great! I was having off flavors with some of my beers using local tap water even though I have a whole house filter system. It is just a sediment filter to remove large particles. I found out that many water supplies use chloramine for purification of water and that might have been the culprit. Since using a single campden tablet in my brew water for up to 10 gallons(I think it can be used for up to 20 gallons), my beers have all seemed to be better. As others noted this is part of my water regimen to prevent any chloramine. I always crush one of these up and treat my water on brew day. It works instantly and is way too cheap to not use and risk chloramine off favors. I am fortunate to have very good tasting water. However, I can smell a slight bit of chlorine/chloramine. So, I simply crush one of these as the instructions state and then proceed normally. My first couple of batches I did not use these and the beer tasted fine. But it is a very small cost to ensure that the chlorine/chloramine don't impact the taste of your brews. So, I now use them on all batches.